Handcrafted by Sally: Shoe Mouse! PaperCrafting:- Cards, Invitations, Table Favours, Table decorations, slowly but surely will be shown on here. Please feel free to add comments or advice. I made this card using one of my new stencils I have bought. 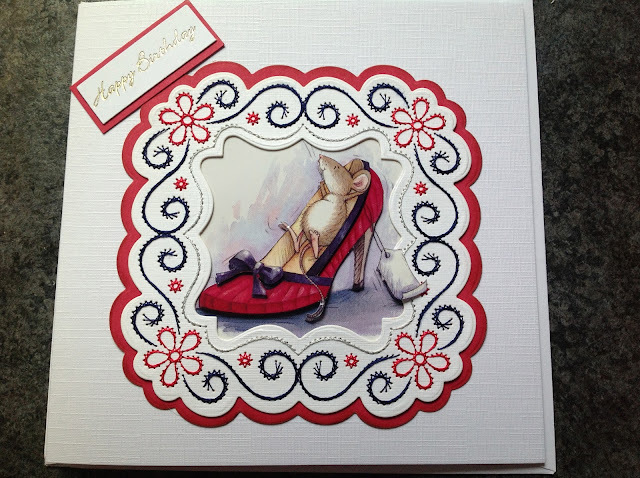 The design is by Ann's Paper Art and they have been produced by Nellies Choice. They are really good. I am not sure where I got the picture of the mouse in the shoe from but I thought it was cute. I picked out the red and navy blue of the picture to stitch the pattern, and then mounted it on red card. I didn't add any ribbons or bows, as I thought it looked ok with just a sentiment in the corner. I was quite pleased with the end result. Welcome to 'Handcrafted by Sally' blogspot - I am excited to share my craft creations, with all who look in. 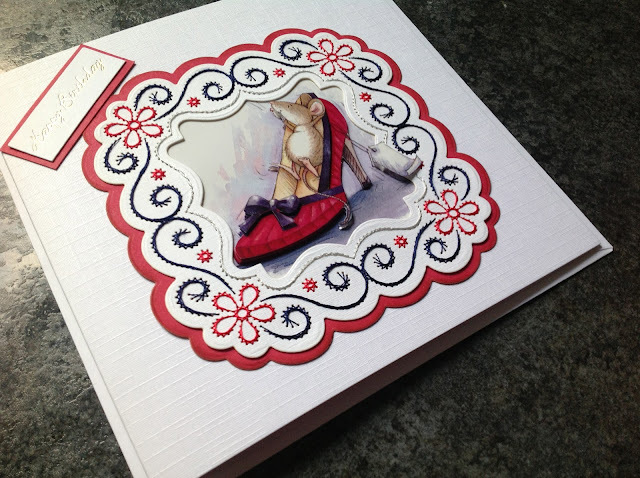 I have always enjoyed creative activities such as novelty cake baking, cross stitch and of course card making. I started paper crafting in 2008 and have enjoyed learning the different techniques over the years, I am still learning. I use to go to a Stitch-A-Greeting craft group each week. I have a group of friends with similar craft interests we meet up once a week, for an enjoyable craft evening and natter. We each take turns at being teacher and we choose something different to create each week. Please look in each week, I try to blog at least once a week.